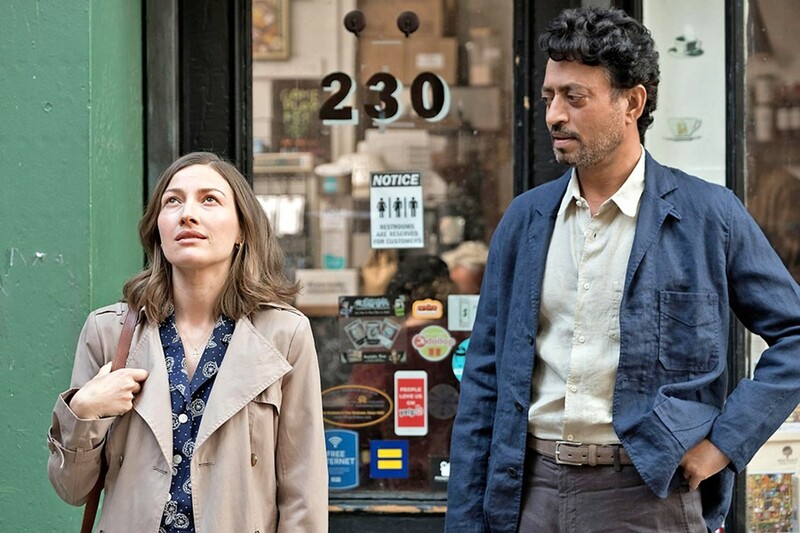 AWAKENING Taken-for-granted suburban mom, Agnes (Kelly Macdonald, left), meets Robert (Irrfan Khan), who shares her love of solving jigsaw puzzles and also shakes her out of her closed life. Glen What a lovely and heartbreaking film this is! The above synopsis is a bit of a misnomer. This is really less about puzzling and more about a personal awakening. Kelly Macdonald is wonderful as Agnes, a melancholy wife and mother who sleepwalks through her days in service to her family. We see her prepare for a party, host, ask her husband, Louie (David Denman), if he's having a good time ... and then we realize the party is for Agnes' own birthday. She's a doormat, and her husband and kids—shy, miserable older son Ziggy (Bubba Weiler) and younger more confident son Gabe (Austin Abrams)—take her for granted. In short, her life is an unfulfilling grind. She needs to learn to take care of herself. As the film opens, it's hard to tell the time period. It could very well be the 1950s judging from Agnes' dress and homemaker work ethic. It's not until she opens one of her gifts—an iPhone—that we realize it's present day. Another of the gifts she receives is a 1,000-piece puzzle, and alone at home, she becomes consumed by it—her mathematical mind perfectly attuned to solving it quickly. Even though she's a brief train ride from New York City, she hasn't been there in years, but in search of another puzzle, she goes to a puzzle shop and sees an ad posted by a champion puzzler looking for a partner. She answers the ad and meets Robert (a truly wonderful Irrfan Khan), an eccentric but lonely inventor, whose one invention—something to do with magnets—has made him rich. Their friendship opens Agnes' world and is the heart of the film. Robert also imparts his understanding of the world, its randomness and uncontrollability, and explains that his love for puzzles stems from the wonderful sense of control it allows him. When you complete one, "you know you've made all the right moves." This film is about Agnes making the right moves that will complete her life. Anna Macdonald breathes complicated and quiet life into her character, Agnes, a woman trapped by her circumstance and mild-mannered ways. Her husband, Louie, isn't a bad guy, but he's controlling and dismissive of his family, Agnes and Ziggy particularly. Everyone around her is used to Agnes taking care of everything, from laundry to dinner to picking up Louie's favored manchego cheese. As long as normalcy is maintained, everyone around her is happy to look away or ignore completely Agnes' utter unhappiness. Apart from Robert, her oldest son Ziggy seems most closely attuned to the subtle change happening inside of his mother, while Gabe is wholly uninterested and Louie feels put upon as the breadwinner of the family. Denman is fantastic in his role, playing Louie as a hardworking and heartfelt man's man whose view of his wife and her place in the world are reminiscent of midcentury machismo. Once the mundane nature of Agnes' home life is well established, we get to see her almost reluctantly journey outside of that world via Robert, who instead of dismissing Agnes sees her as a beautiful, complicated woman with much to offer. This film is all about the performances, and the subtle character work the cast put into their roles shines through brilliantly. It's not a feel-good film to be sure, but certainly one you will probably be glad to see nonetheless. There's real beauty in this story. Glen I've never seen Rompecabeza (2009), the Argentinian film upon which Puzzle is based, but I'm certainly interested. Its writer and director, Natalia Smirnoff, had worked as a second unit director, but Rompecabeza was her feature film debut as writer-director. She also wrote and directed a 2014 film called El Cerrojero (Lock Charmer), about a relationship-averse locksmith with metaphysical abilities. They're both on my to-see list! The American version of Puzzle was co-written by first-time screenwriter Polly Mann and veteran screenwriter Oren Moverman (Jesus' Son, The Messenger, Rampart, Love & Mercy). The combination of excellent writing and acting makes Puzzle well worth watching. I, too, thought Denman as Louie was great, but he was not a complicated character. In fact, Louie was a simple man perfectly happy in his comfortable rut. Macdonald and Khan, on the other hand, had very complicated characters to flesh out, but more so for Macdonald since Agnes has the biggest character arc. She really changes and grows, and the scenes between Agnes and Louie as she begins to assert herself are wonderful because Louie—who loves Agnes—is shocked at her inner strength, which he's just seeing for the first time. Still, Khan is my favorite. His Robert is complicated and wise, but also vulnerable and pathetic—not an easy combination to pull off. The ending? It's amazing, and it both surprised me and felt perfect. This is simply a wonderful film. 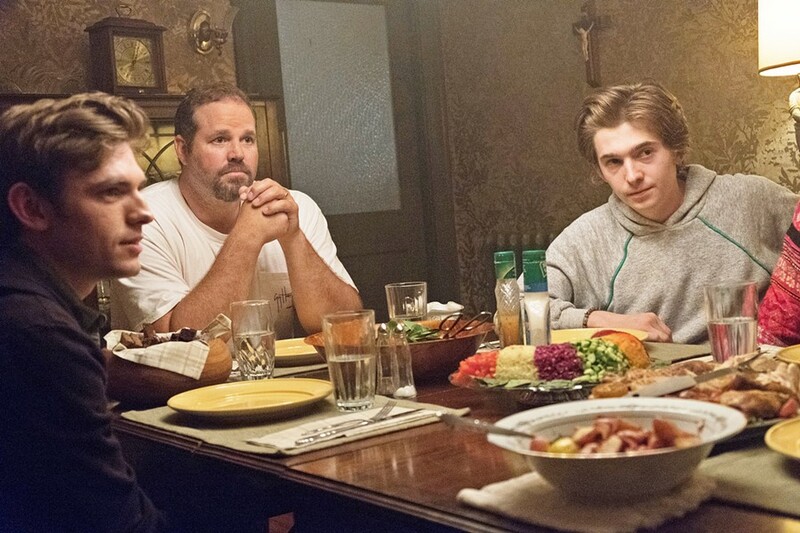 EXPECTATION (Left to right) Son Ziggy (Bubba Weiler), husband Louie (David Denman), and other son Gabe (Austin Abrams) have come to expect Agnes to wait on them hand and foot.